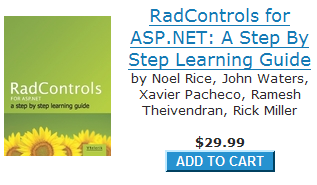 At the beginning of the summer we introduced an incredible new learning resource to the Telerik community in the form of a full book dedicated to the RadControls for ASP.NET. Clocking in at just over 620 pages, though, this free PDF is not exactly laser printer friendly. To save you the hassle of waiting on 620 pages to print and to save you from the glares your co-workers would certainly provide as they wait on their print outs, we have decided to make the learning guide available in print! Taking advantage of the latest in on-demand publishing, Telerik is offering the Learning Guide in print through top-rated printer Lulu.com. What does on-demand publishing mean? It means you'll be able to buy a copy of the Learning Guide that looks just like a tech book you'd buy at your local bookstore with the latest Learning Guide content at an incredibly affordable price. The only downside to on-demand publishing is that you'll have to wait a couple of extra days for your book to ship since (as many fast food chains claim) they don't make it 'til you order it. The service is quite incredible and a great way to get the Learning Guide in print if you prefer reading books over on-screen PDFs. And at $29.99, I challenge you to find another 620+ tech book that gives you so much for so little. Order your copy today and add it to your essential tech book library. We are using Telerik in our project and are very happy with it. We'd like to connect with someone who is expert in styling the controls to be consistent with our color scheme and look. A few days work I imagine. Can you recommend someone? We have a number of partners that can provide the service you're looking for. Shoot me an email at todd.anglin[no spam at]telerik.com and I'll send you some recommendations.